It’s been awhile since we’ve had a Meatless Monday, hasn’t it? Each year, during the season of Lent, I enjoy exploring and sharing amazing vegetarian recipes. And each year, as Lent comes to a close with the celebration of Easter, I vow to continue making and sharing beautiful vegetarian recipes. And then a month goes by and I realize that I haven’t made a single vegetarian meal! So I thought I’d start small with an amazing veggie-ful alfredo pizza! 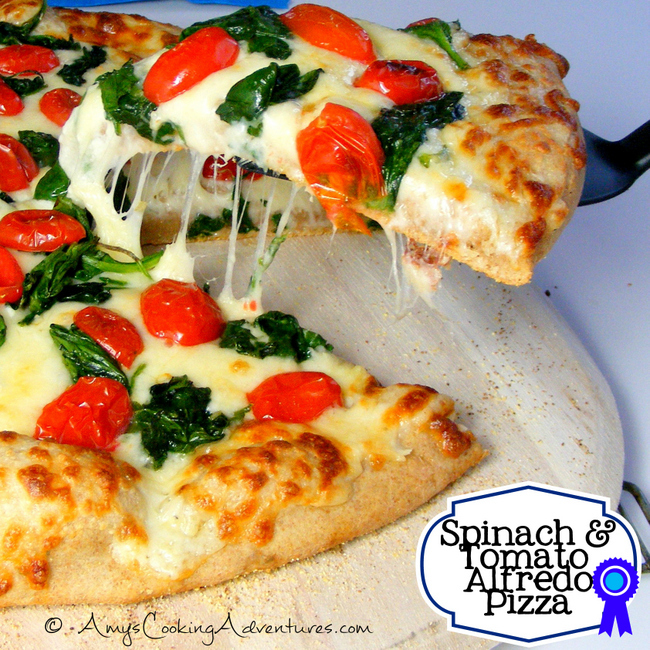 There’s so much good stuff going on (whole wheat crust, spinach, tomatoes), that you don’t have to feel guilty treating yourself with alfredo! To make the crust, whisk together the water, yeast, and honey in the bowl of a stand mixer. Let the mixture set for 2-5 minutes or until foamy. Add in the dry milk, salt, basil, olive oil, flax, vital wheat gluten, and whole wheat flour and mix with the paddle attachment on low speed. Add in the all purpose flour and switch to the dough hook and knead on low speed for 5-7 minutes or until the dough forms a smooth ball. Spray a large bowl with non stick spray, add the dough and turn to coat. Cover the bowl lightly with plastic wrap and set in a warm place until doubled in size, about 1 ½ hours. Preheat the oven to 400 degrees F, place a pizza stone in the oven at least 30 minutes before cooking, if using. While the oven preheats, make the alfredo sauce (or reheat it if using leftover sauce). In a separate skillet, heat the olive oil over medium heat. Add the garlic and cook for 30 seconds. Then, add the spinach and cook until wilted, about 2 minutes. Remove from heat and set aside. Once the dough has risen, split it into two halves. Roll each half out on a pizza peal that has been sprinkled with cornmeal. Spread about ¼ cup of alfredo over the pizza, followed by the cheese, wilted spinach, and tomatoes. Slide the pizza onto the pizza stone and bake for 7-9 minutes, or until the crust is browned and the cheese is melted. Ahhh this pizza looks SO good!!! I love the flavor combo! 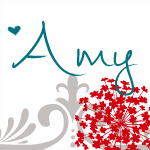 Amy, this pizza looks sensational. Terrific flavors on a hearty crust...I wouldn't feel deprived or guilty! yum! that pizza looks soooo good. we make pizza once a week, and i'm always looking for different variations to spice it up a bit. will need to try this one! This pizza looks beautiful! Pinned :) Thanks for sharing on Two Cup Tuesday at Pint Sized Baker!